Dual-Link DVI has been the premium multi-monitor interface of choice, but that’s likely to change now. Being digital, DVI doesn’t have VGA’s requirement for one digital-to-analog converter (DAC) per output port, yet it does require a dedicated clock source for each output. This design element is also true of HDMI.) According to AMD, the signaling demands of DVI require so many I/O pins from the GPU that extending beyond two displays was impractical. Engineers at ATI recognized this even back in 2004 and started working on ideas to move beyond DVI’s limitations—ideas that AMD inherited and continued to develop after the ATI acquisition. The first version of DisplayPort was finalized in 2006; the current version 1.2 was only recently approved last December. The key advantage of DisplayPort is that there’s no need for a clock signal. Each data link is set to either 1.62 or 2.7 Gb/s per lane regardless of the timing used by the target display. DisplayPort simply buries the clock signal within the data stream. Freed from the need for dedicated, independent clock signals, a single clock source can regulate as many output streams as the GPU can support. DisplayPort uses the same number of pins as Single-Link DVI, but it can support full resolution on a 2-meter cable, 1920x1080p over a 15-meter cable, up to 17.2 Gbs per channel for higher resolutions, up to 16 bits per color channel, and multiple video streams over a single connection. So, if output to six monitors from one card sounds impressive, you have to wonder if future GPUs will leverage this multi-stream capabilities to multiply monitor counts even further. Consider the implications for being able to feed multiple monitors from a single DP port on a mini-ITX board or a notebook. As of version 1.2, you can even daisy chain DisplayPort monitors, feeding multiple monitors with only one DisplayPort connector. In our follow-up Eyefinity coverage, we’ll take a closer look at DisplayPort adapters. For now, know that adapters will allow streams from a DP port to display on HDMI or DVI devices. Like HDMI, DisplayPort can carry audio alongside video on the same connection. The DisplayPort++ feature allows for pass-through of a combined audio/video HDMI stream, but DP++ is not universally supported, so if this is a feature you suspect you’ll need, ask the adapter manufacturer before buying. Note that adapters only work from DisplayPort to legacy formats. You can’t output VGA, DVI, or HDMI on a DisplayPort monitor. Predictably, DisplayPort is fully compliant with prior DRM technologies and some forward-looking DRM besides, so don’t look for DP to make ripping any easier. On the monitor side, Dell was the first and still most ardent supporter of DisplayPort. In 2008, Apple jumped all over Mini DisplayPort, which it designed. Mini DisplayPort became part of the DisplayPort 1.2 spec and can support resolutions up to 2560x1600. With AMD’s Radeon HD 5700- and 5800-series cards, DisplayPort is supported throughout the entire product line, and a host of major notebook OEMs now or will soon support the format. Clearly, DisplayPort is on its way to being the next major display standard throughout the computing world. Further investment in legacy formats looks more risky with each passing week. Second page mentions a Radeon 5890, I presume you mean either the 5870 or 5970. @sykar My thoughts exactly. It has to be an odd number of monitors, otherwise you'll get the crosshair right in the middle. That would bug the crap out of me. "In assessing single- versus dual-monitor (18" LCDs) usage in everyday work environment applications"
The key word in your statement is DUAL monitors. I recall another study that tested how much people prefer 3 or 4 monitors over 2, and it was a very small percent (~10%). For a lot of tasks outside of gaming, you don't want your entire vision filled with pixels. You don't want to get dizzy constantly from moving your head back and forth. Of course eyefinity is great if you want to blow a ton of money for a wall of monitors and your career is a stock trader, CERN mission controller, etc, but I'd rather stick with 3 physical and use virtual desktops for 3+. It all made sense to me, until I saw the picture of the kid playing a Racing game on that 6 monitor set up. It looked ridiculous. Why not just play on a big TV that has no lines and only requires 1 output? Trueno07It all made sense to me, until I saw the picture of the kid playing a Racing game on that 6 monitor set up. It looked ridiculous. Why not just play on a big TV that has no lines and only requires 1 output? Absolutely, this one is quite ridiculous. Multiple displays only make sense for games if you sit closely and angle them. But the borders would still annoy the hell out of me. This may be a nice gimmick for some, but ultimately we'll be moving to curved screens. I used to use two monitors but since I went to three CRT monitors 5+ yrs ago I can't go back to two. This bezel in the middle is aggravating. I use three monitors for work - presentations/writing/graphics and the extra real estate is very valuable there. For play, I have been waiting for the hardware to improve to the point where 3 monitor frame rates are good enough and this eyefinity article has got me thinking that the new ATI cards might be worth a try. I think the next generation will be the game changer when three monitor play frame rates are over 50 for the games we like to play. I would be surprised if there are many who once they get used to three monitors would willingly go back to two. Big TV lacks the same resolution. Bezeless is hard to manufacture. I don't see the point in using Eye-finity in the method specified with multiple monitors in the front. I would rather setup like the Cave and Stereoscopic display. Borders wouldn't be much of an issue then. 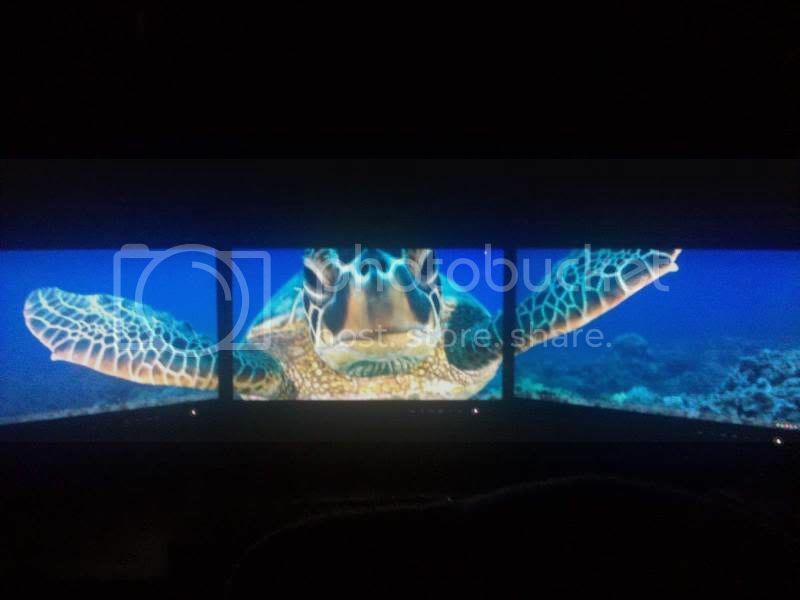 4 x 55" display, 1 front, 1 on each side, and 1 above. Eyefinity is amazing with three screens, you don't notice the bezels at all in most games. SmarterChoiceEyefinity is amazing with three screens, you don't notice the bezels at all in most games. How can you not notice .5" bezels? Because you aren't looking at the bezels, you are looking at the screen. Too many people comment on this without having the first idea about what it is like. In fps games, driving games, flight sims you DO NOT notice the bezels. The only games where the bezels are noticable is in flat 2d type board games ie empire total war campaign map. I have it so I know what it's like. Read some reviews and they will tell you the same thing. Wheat_ThinsHow can you not notice .5" bezels? let me ask you this, have you ever done a dual screen setup? If so then how many times have you payed attention to different resolutions, bezels/ bezels thicknesses, and different makers of monitors? My guess would probably be no. Now i haven't used eyefinity although i have used dual screen setups, but i can understand how people don't notice thing when your that focus on something. In this case, most peoples don't looking for the unlit bezels, there eyes are going to jump to the next bright screen that they need to see and there minds will just filter the bezels out, giving the full clean picture. Having switched over to 3 24" 1080P monitors in December...I can't imagine going back. Honestly, like Smarter Choice and Warmon said...you don't notice the bezels. Admittedly, I did it originally for the desktop space, but after playing Dragon Age, Crysis and Bioshock, and wondering about the bezel space, I can tell you in 5760x1080 eyefinity that you honestly don't even notice it. It's an absolute joy and my gaming will never be the same. I think some people are just a little a.r. and WANT to see the bezels and WANT to make it an issue, but if you give it a chance you'll be surprised. I actually arranged mine so the side two overlap the middle one to reduce some of the bezel space but still...it's really not noticeable. The 10.3 drivers will introduce a "hide" option where instead of having a gap between monitors (half of a building on one monitor and the other half on the other monitor) it will actually hide the image behind the bezel so you get, maybe, 1/3 of the building on each monitor and the other 1/3 hidden by the bezel (think tall thin building, obviously). Sort of like wearing a pair of sunglasses with bigger rims. The image is there, but will be hidden by the rims. You'll specify how wide your bezels are and the driver will handle it from there. That, actually, will make things a bit more interesting. Of course, I'm not so sure in FPS it would be good as you could, theoretically, have someone hiding in that bezel area as they approach instead of definitely seeing them on a monitor somewhere. Bottom line - don't knock it before you at least try it. See if you can borrow some friends' monitors and hook 'em up to your 58xx card and try it out. I promise it'll be your next expense to budget for. I have a question... how much hardware is required to deal with such resolutions or the amount of windows displayed... (gamming and productivity) I mean if i have to upgrade from 3 to 6 gb of ram or 4 to 8 for example or even change processor. Just like you don't notice the pillars between the windshield and side windows of your car. Your brain just ignores the parts that it doesn't want to see. Great Article. Looking forward to the next article. Man Cave! Six large screens! I need a larger apartment. I may even have to rent a large house. i dont know if i am an idiot but i still dont understand the difference between hooking up 3 monitors to a 48 series and eyeinfinity. Useless for us 30" monitor users until the drivers support Portrait+Landscape+portrait in eyefinity. You would think it would naturally support this. What a shame. If you want this setup you need to use SoftTH, biggest problem with that is you can only utilize the power of one GPU. If you can raed tihs, you hvae a wroknig hmunam mnid. The mind works misteriously and can read any word as long as first and last letter is in order, the middle part does not matter as much. Theres a whole article on this, somewhere on the net, basically, the bazel's are considered the middle part and you wnot nctoyie them in real life situations! I just received my $20 adapter from dx today and can confirm that everything works correctly with my 3x 24" monitors @ 1920x1200 each. Take a $50 to IKEA, look for MIKAEL, there's your Eyefinity on a budget Desk. You'll have to figure out a good way to rig speakers with it of course, easier if you're going portrait.